By default, you already have a single FTP acoount. Use youe cPanel username and password to login to it. Creating new FTP accounts can be done to give FTP access to other people without giving them yor cPanel log in credentials. FTP Accounts allows you to access your web site's file through a protocol called FTP. You will need a third party FTP programme access your files. 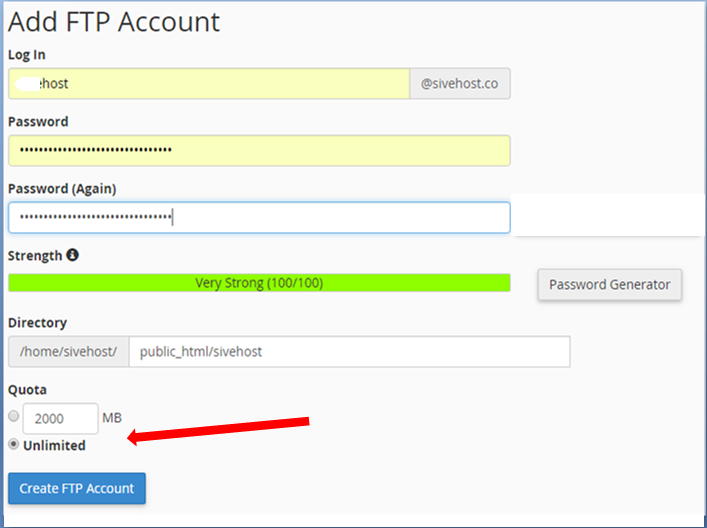 You can log into FTP account by entering your username and password of the account you wish to log into. A recommanded directory will be automatically generated. You can change this directory whenever you'd like. The FTP account will be limited to the specified directory and any subdirectories. You can also set a disk space quota for the account. Then you click the Create FTP Account button.